Annie (Anne) Kidd Hart was the first of eight children born to John Adolphus Hart (c1849–1930) and his first wife Ann née Kidd (1854­–1908). Annie’s father and mother were both born in Melbourne in the early years of the settlement. On the Hart side, George Hart, a carpenter by trade, had come with his young new wife Sarah (‘housekeeper’) on the Cornwall from Plymouth in 1848. When he died forty years later in 1888, probate documents described him as a ‘land selector’ from Darnum in Gippsland. George and Sarah had two sons, John Adolphus, later to be Annie’s father and a member of Victoria Police, and Herbert, a brewer in Collingwood who died at the early age of 34 in 1888. Annie’s mother Anne Kidd was born in Emerald Hill (later South Melbourne) in 1854. Her parents William (occupation: clerk) and Sarah had arrived in February that year on the Cambodia. They joined a number of Kidds in the colony as well as the thousands of immigrants who came to seek their fortunes in the gold rushes. John Adolphus Hart and Anne Kidd married in 1875. Annie (registered as Anne) Kidd Hart was born the same year, and her birth was registered in Macedon. Seven more children were born over the next two decades, all in the Macedon-Gisborne area: Bessie Alice in 1877, Ethel (1880), Maude Evelyn (1882), Arthur Roy (1885), Elsie May (1890), William Leslie (1892) and Geoffrey John (1896). All survived well into adulthood with the exception of Maude who died in 1889 aged seven. In 1879, four year old Annie's father John Adolphus joined Victoria Police. He was a constable for thirty years, and for more than twenty was in charge of the police station in Gisborne. The steadily growing family lived in the solid brick residence near the police, court house and shire office complex (Pictorial Gisborne: A Journey Through Time 1851-2001, Gisborne and Mt Macedon Historical Society, pp57-58). His activities were documented in the local newspapers: dealing with drunk and disorderly citizens on the streets and in court, providing river level readings and flood warnings, arranging assistance for indigent members of the community, and inspecting businesses from fisheries to abbattoirs for potential breaches of health regulations. When he retired from Victoria Police in 1907, he was lauded by the local magistrates for his ‘fair and straightforward manner’ in court and by the local press for his manner of dealing with his duties, ‘sometimes of an unpleasant nature, with the least friction’ (Sunbury News, 3.8.1907, p2; Gisborne Gazette, 26.7.1907 [p2]). According to the local Sunbury News, Constable Hart planned to remain with his family in Gisborne. Sadly, his wife Anne died a few months later, succumbing to pneumonia in January 1908 (Gisborne Gazette, 10.1.1908). Their youngest child, Geoffrey, was about 11, the others aged between 15 and 33. In the early years of the new century, the family dispersed. Bessie (second eldest) had married an accountant in 1902 and they moved to Melbourne. Her youngest sisters, Alice and Ethel, also came to Melbourne. Alice trained at the Melbourne Hospital in Carlton and by 1914 had been a Sister there for almost five years. The same year, Ethel was matron of the long-established Foundling Hospital in Berry St, East Melbourne, an institution which provided care for unmarried pregnant women, their babies and orphans as well as training for women in what would later be termed ‘mothercraft nursing’. By the time war broke out in 1914, Annie’s three brothers and their father had moved to Western Australia – land of mining and agricultural opportunities in the pre-war years. Brothers Arthur, William and Geoffrey and their father John settled and farmed near Kojonup and Katanning, adjacent communities in the state’s south west. They remained in Western Australia for the rest of their lives. In 1914, Annie Kidd Hart was in her late 30s, an experienced nurse and free of family responsibilities. She applied to join the Australian Army Nursing Service in November 1914. 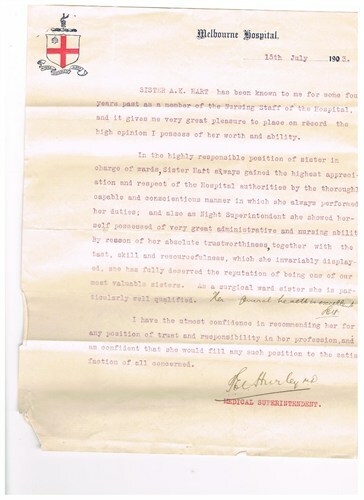 Her application was signed by Miss Jane Bell, principal matron of the 3rd Military District (Victoria) and chief recruiter for nurses for No 1 Australian General Hospital. Bell was also Lady Superintendent of the Melbourne Hospital where Alice nursed, and a powerful personality (Lyndsay Gardiner, 'Bell, Jane (1873–1959)', Australian Dictionary of Biography, National Centre of Biography, Australian National University, http://adb.anu.edu.au/biography/bell-jane-5195/text8737, published in hardcopy 1979, accessed online 21 September 2014). She understated her age by two years and named her sister Ethel, matron of the Foundling Hospital in East Melbourne, as her next of kin. Annie was not the only member of her family to enlist nor, despite the early date, the first. Arthur had already enlisted in early October 1914 and sailed with the 10th Light Horse Regiment in February 1915; youngest brother Geoffrey enlisted as Arthur sailed, and served as a driver with the 28th Infantry Battalion from mid 1915. Arthur was wounded and repatriated to Australia in 1916, Geoffrey returned in 1919. After a fine farewell from the Royal Victorian Trained Nurses Association (Punch, 26.11.1914), Annie embarked on the Kyarra on 5 December 1914 and sailed from Melbourne with medical personnel of 1 and 2 Australian General Hospitals. She had had only days in which to equip herself with the necessary uniform and kit. She was appointed with the rank of Sister. Kyarra reached Egypt on 20 January 1915. Instead of proceeding to France as Hart expected, the medical personnel were sent to Cairo to set up their hospital in the Heliopolis Palace Hotel, a four storey luxury facility. Hart described the nurses’ quarters as ‘very comfortable indeed’, although she was less impressed with the quality and cost of their mess. The hotel did not convert readily into a hospital, though the facility was ‘very well equipped’. Hart was attached to 1AGH at a time of near continuous high drama. The deluge of casualties evacuated from the Gallipoli peninsula placed enormous physical and emotional demands on the nursing staff which was expanded with reinforcements as the number of beds expanded (see Rees, The Other ANZACS, pp. 44-45, 48-49). In Hart’s words, ‘the work was very heavy, especially after the landing of our troops at Gallipoli. We found the heat very trying and the flies and dust made it very difficult to bear.’ On the hand, pressure was relieved to some extent because ‘when possible we had every other half day off duty’, providing opportunities to sightsee in an exotic culture on the hospital’s doorstep. Hart was awarded the Royal Red Cross (2nd Class) decoration for her service in Egypt. In December 1915, Hart left Egypt on the hospital ship Wandilla with invalided troops being repatriated to Australia (Hart, Service Record). On her return in early 1916, Hart was sent for duty to 1 Australian Stationary Hospital in Ismailia, 110 kilometres from Cairo. She described it as ‘an extremely nice Hospital … beautifully situated, and here we were excellently equipped and perfectly happy.’ There were amusements for the patients, boating and swimming in the lake, and beautiful gardens. 1ASH treated sick troops from nearby camps and then the severely wounded Light Horsemen following battles in Palestine. For all her glowing account, Hart was hospitalised with dysentery and colitis while she was at 1ASH. In early 1917, Hart was transferred to Cobham Hall, a convalescent hospital for officers in the manor and grounds belonging to the Countess of Darnley. That too she described as a ’beautiful’ facility. The officers were convalescent and in contrast to her patients at 3AAH enjoyed ample amusements such as tennis, golf and country drives (Hart, Interview … Matron Kellett). In August 1917 Hart was sent to France, where she was to see out the remainder of the war. She went first to 3 Australian General Hospital newly located in Abbeville. 3AGH had 1500 beds, medical officers and 90 sisters. They were soon inundated with sick and wounded troops direct from the front, usually several hundred at a time. Again Hart described the conditions as ‘excellent’. In November 1917 as the Somme winter set in, Hart was sent to No 5 Stationary Hospital in Dieppe, 60 kilometres away on the coast. No 5SH was a British hospital staffed with Australian nurses and British doctors. Hart, who had been promoted temporarily to matron, did not find the arrangement a ‘happy combination’. She described the patients as mainly local people and American soldiers awaiting evacuation. She did not mention in her interview the bitterly cold winter, the cost and shortages of food and paraffin oil, mine explosions in the harbour, the convoys of wounded troops, or the icicles hanging from the walls of the nurses’ billet described by one of her nurses Elsie Tranter in her diary (see Susanna de Vries, Australian Heroines: Gallipoli, Lemnos and the Western Front, 2013, pp291-97). Hart’s responsibilities in this environment were challenging, and made more difficult it appeared by the British medical officers. Hart was at Dieppe for six months before she returned to her unit, 1 AGH in Rouen in June 1918 as head sister/acting assistant matron. It was she said, ‘well-equipped and excellently managed’. Hart (always understated in her accounts of nursing work) said ‘there [was] some very heavy work from the retreat, also the advance, and the severe influenza epidemic.’ (Hart, Interview … Matron Kellett). Hart was a most welcome addition to the nursing establishment (just over 100). Matron Cornwell described her as ‘remarkably good’ (1AGH, War Diary, May 1918). The situation was difficult: influenza cases, many Australian casualties in the wake of fighting around Villers-Bretonneux as well as patients ‘very dangerously ill’ from the effects of gas poisoning, and air raid alarms. The nurses’ accommodation regularly lacked hot water. Nevertheless, the Commanding Officer reported ‘the nurses have stood the strain very well and have worked admirably’ (1 AGH, War Diary, September 1918). Head Sister Hart was acting matron in October 1918, and acquitted herself in a ‘highly satisfactory manner’. The work in that period was very strenuous; both admissions and deaths exceeded all previous records in the unit because of the final military operations and influenza. Many of the nursing sisters succumbed to either influenza or exhaustion or both, but Hart’s service record suggests she escaped both. Hart was mentioned in despatches from General Douglas Haig for her work in this period. With the cessation of hostilities on 11 November 1918, 1 AGH began to empty as patients were evacuated. Nursing staff were sent on leave – Hart went to Paris for a week. Through out December 1918 and January 1919, 1 AGH packed up and moved to Sutton Veny in Wiltshire, England. Hart disembarked at Southampton on the eve of Christmas 1918. It was another six months before Hart reached Australia. She worked at 1 AGH Sutton Veny for several months, preparing patients for repatriation back to Australia. After a fortnight’s leave in April, she was sent to Weymouth Camp, where thousands of Australian troops were congregated awaiting return to Australia. She was in charge of the nursing sisters there. ‘The work’, she wrote, ‘was not severe, as the Hospital was on the eve of closing’ (Hart, Interview … Matron Kellett). When it closed, she was sent briefly to 3 Australian Auxiliary Hospital before returning to Australia in charge of the nursing sisters on the transport Norman. Hart may have been re-united with her brothers and father when the Norman docked in Fremantle. She disembarked in ’brilliant sunshine’ at Port Melbourne on 18 August 1919 (Argus, 19 August 1919). She was discharged from the AIF on 1 December 1919. Like many returned members of the AANS, Anne Kidd Hart spent the rest of her professional life nursing returned troops. After a time living with her married sister Bessie Cook in Malvern, Hart moved to Sydney in the early 1920s to work at the Repatriation Hospital in Randwick (Fourth Australian Repatriation Hospital; Prince of Wales Hospital). She was matron there for over a decade until late 1937. As described by one of its doctors the same year, the hospital had around 400 beds in constant use and treated up to 6000 outpatients every month (Examiner, 18.1.1937, p9). The patients, he said, were ‘returned men with recurring complaints or whose wounds break down, making an operation necessary’. In her role as matron, Hart accompanied visiting dignitaries around the hospital – politicians, the papal legate, celebrities such as the aviator Amy Johnson, and royalty like the Duke and Duchess of York when they visited Australia in 1927 (e.g. Sydney Morning Herald, 22.9.1928, p6, 11.6.1930, p13; North Western Courier, 31.3.1927, p7). The Duke and Duchess were much affected, the press reported, by bedridden, paralysed and otherwise ‘desperately sick men’ they encountered there. There was nothing petty in her mind and her example will be an inspiration to those who follow after. Her sense of humour eased the tension in many a difficul situation in her work at home and abroad. Moreover it never hurt anyone. With many thanks to the descendants of Annie Kidd Hart for photographs from her collection.